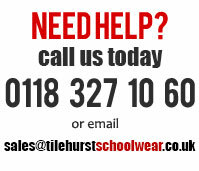 This is an OPTIONAL part of the Little Heath School PE Kit. If you want to pick up your order choose "collect from store" when checking out. If you are not sure about sizes don't worry! We will exchange any Little Heath school clothing ordered on or offline for the correct size as long as it has not been damaged, soiled, washed, altered or worn (other than trying it on for size of course).